Worship at MLLC at 7:30 p.m. This worship service will feature several elements. 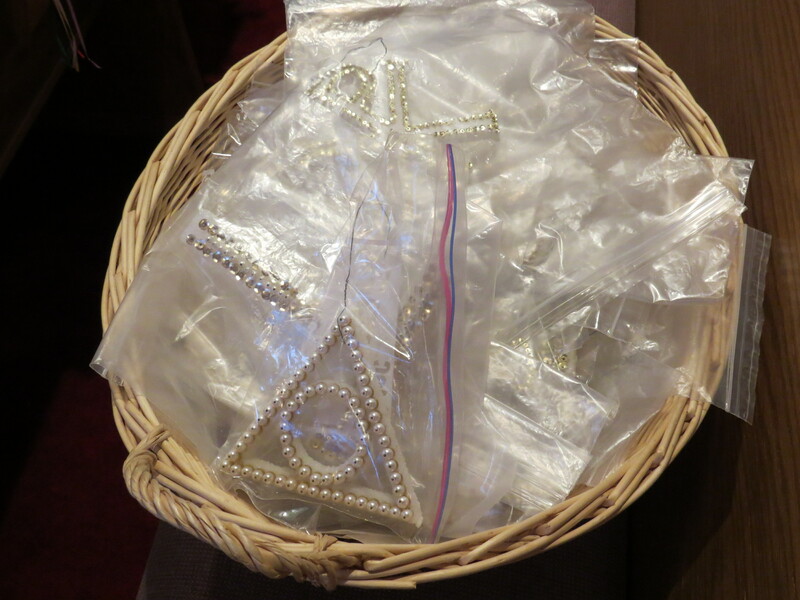 Several youth will receive their First Holy Communion, and will be presented Bibles from the church. Additionally, there will be the washing of Feet and Hands. At the end of worship we will have the Stripping of the Altar as a symbolic way of remembering the arrest, trial and torture of Jesus. There will also be a Maundy Thursday Service at 5:45 p.m. at Waldeck Evangelical Lutheran Church, our shared ministry partner. The Church is located at 6915 Waldeck Church Lane, Ledbetter, TX 78946 – this is about 6 miles south of Ledbetter at the corner of FM 2145 and FM 1291. We will be remembering the Suffering and Death of Jesus Christ our Lord. This will include the reading of the St. John Passion account from chapters 18 and 19. At the end of worship we will prayerfully ponder the Seven Last Words of Christ. Service of Light, Services of Readings, Remembrance of Baptism, First Holy Communion in celebration of the Resurrection of Jesus Christ. This is the first of our three worship services celebrating the Resurrection of Jesus Christ. Click this link to view a blog post from the Evangelical Lutheran Church in America (ELCA) regarding this service and its connections with Maundy Thursday and Good Friday. Click this link to view a blog post by our own Jennifer Clark Tinker which tells about her experience and joy related to attending the Great Vigil of Easter each year. 6:45 a.m. – Sunrise Service at Carmine Cemetery – a joint event with Waldeck Lutheran Church. Bring a lawn or folding chair for seating at the cemetery. 8:00 a.m. – Festival Service with Holy Communion. This will be outside in the covered pavilion, as weather permits, or inside as needed. After worship – Easter Breakfast. This will be a pot-luck meal, and you are invited to bring a food item to share. Our Newsletter Archive Page has been updated. Click this link to go to that page. There you will find all the newsletters of recent months and years. If you have an announcement for the May 2019 church newsletter, please get it to the office by Tuesday, April 19, 2019. That way can make sure it is included. We are looking forward to our annual observance of Holy Week here at MLLC in Carmine. This is a powerful event which connects us to the core message and story of Jesus Christ. We invite you to participate in these meaningful and reflective services. Each is quite unique from what we do on other days of the year. The actions and words in worship guide us through the various events of this final week of Jesus’ ministry. In recent years some people have gotten out of the good habit of participating in the various Holy Week services. This year can be a blessed opportunity for any and all to recommit to engaging in the story of Jesus through the Holy Week services. We will share our services with our partner church, Waldeck Evangelical Lutheran Church in Ledbetter. Information about when and where we will be gathered for worship is noted in the schedule. Here is the link to the Holy Week 2019 schedule: click link. New Member Saturday was held at MLLC on March 9, 2019. We welcomed three new members to the congregation. Seated left to right: Jesse McDaniel, Wendy McDaniel, and Sheryl Pratt. After worship a reception was held to celebrate God’s love and our life together. Welcome Jesse & Wendy, and Sheryl. 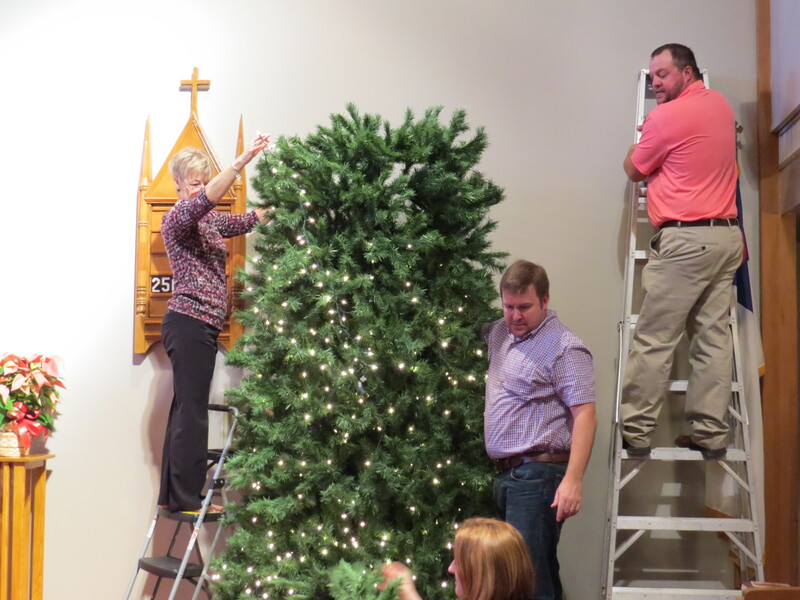 Jesse and Wendy transferred to MLLC from a Lutheran Church in Friendswood, TX. Sheryl transferred from Martin Luther Lutheran in Giddings, TX. Thanks to the Care/Outreach Committee for hosting the reception. We look forward to our years ahead in mission and ministry as God’s people together in Carmine. We had a successful collection of donations for the 2019 Souper Bowl of Caring and Food Drive in February. The LYO made the goal of $700.00 to give to the A.M.E.N. Food Pantry in La Grange (our county seat). With the final donations in the past week we were able to meet that goal. Here is a link to the office Souper Bowl of Caring web site. Added to that were the in kind donations of food and other needed items for the food pantry. Approximately 60 items were also collected at MLLC in February and then brought to the food Pantry. We are very thankful for the wonderful partnership we have in the congregation as we seek to love our neighbors. Here is the report on the Souper Bowl of Caring official web site: click link. Again, thank you for your partnership and support of this annual event at MLLC. Ash Wednesday services will be at both MLLC and Waldeck Evangelical Lutheran Church. You are invited to choose which one best suits your situation. Both services will offer Holy Communion and the Imposition of Ashes as we begin our Lenten Season. Worship at Waldeck Lutheran Church at 5:45 p.m.
Waldeck Evangelical Lutheran Church is in a shared ministry with MLLC. The Church is located at 6915 Waldeck Church Lane, Ledbetter, TX 78946 – this is about 6.5 miles south of Ledbetter at the corner of FM 2145 and FM 1291. Brothers and sisters: God created us to experience joy in communion with him, to love all humanity, and to live in harmony with all of his creation. But sin separates us from God, our neighbors, and creation, and so we do not enjoy the life our Creator intended for us. Also, by our sin we grieve our Father, who does not desire us to come under his judgment, but to turn to him and live. As disciples of the Lord Jesus we are called to struggle against everything that leads us away from love of God and neighbor. Repentance, fasting, prayer, and works of love—the discipline of Lent—help us to wage our spiritual warfare. I invite you, therefore, to commit yourselves to this struggle and confess your sins, asking our Father for strength to persevere in your Lenten discipline. 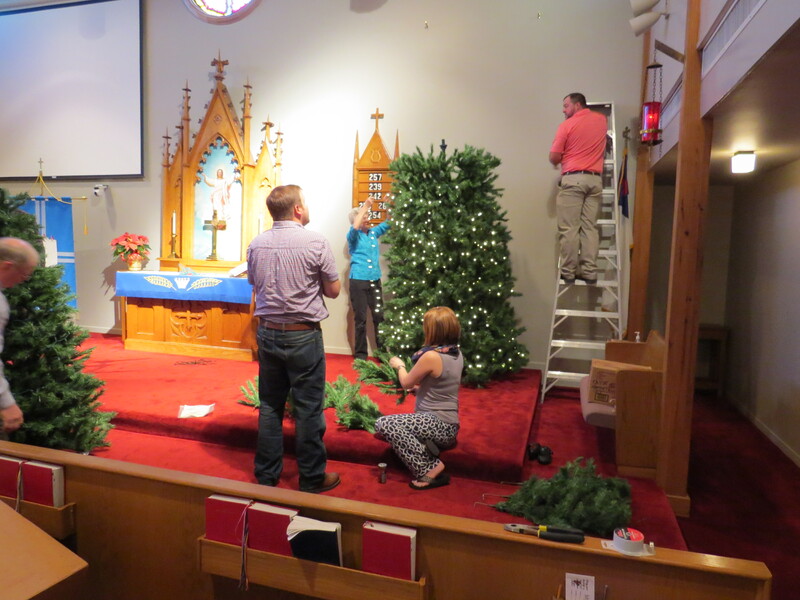 We are very blessed by the opportunity to work side by side with the people of Waldeck Evangelical Lutheran Church. Together we are glorifying God, loving our neighbors and loving one another. No Service at MLLC on February 3 – Worship at Lutherhill instead. We will have worship on Sunday, February 3, but it will not be at MLLC. Worship will be held at our local Lutheran Church camp, Lutherhill Ministries. We will gather for worship at 9:30 a.m. in the Carby Chapel on the camp grounds. The photo above shows the Carby Chapel from the road and parking lot viewpoint. Refreshments, plus a presentation by Matt Kindsvatter (Executive Director of Lutherhill) regarding their upcoming improvements and expansions of ministry. We look to have a strong showing from the people of Martin Luther Lutheran Church, and all the Crossroads churches, for this special event. If you use your MLLC offering envelope or write a check to MLLC, the offerings will be given to the church. Correction: Cash donations will be divided evenly between the 4 churches. There will also be a special basket and special envelopes for donations to Lutherhill’s campaign. You can also take the envelopes and give by mail at a later date. We encourage you to bring folks who may be uncomfortable traveling to the camp on their own, or who would need a ride. This will be a wonderful event for all ages. Lutherhill is located just north of La Grange at 3782 Lutherhill Rd, La Grange, TX 78945. 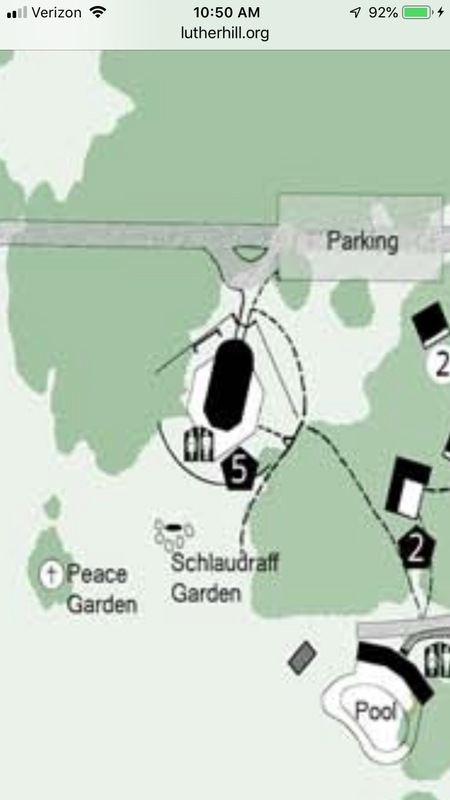 Once you enter the main camp entrance, you will be heading east. Follow the long gravel road until you see the signs for Carby Chapel. This will lead you to follow a road to the left/north, which leads to the chapel. This part of the camp is depicted on the map noted right below on this page. Carby Chapel is in the north central part of the camp. Here is a camp map link: Map. Here is a close up of the portion with Carby Chapel and nearby parking. This is a once a year special event in which we gather with our group of 4 Crossroads Shared Lutheran Ministry partner churches for a time of worship and learning. Christmas Eve, December 24, 6:00 p.m. at MLLC. This will be a Candlelight Service led by the youth of MLLC. Christmas Day, December 25, 10:00 a.m. at MLLC. The annual festival of the Nativity of our Lord. Joyful singing, Holy Communion. 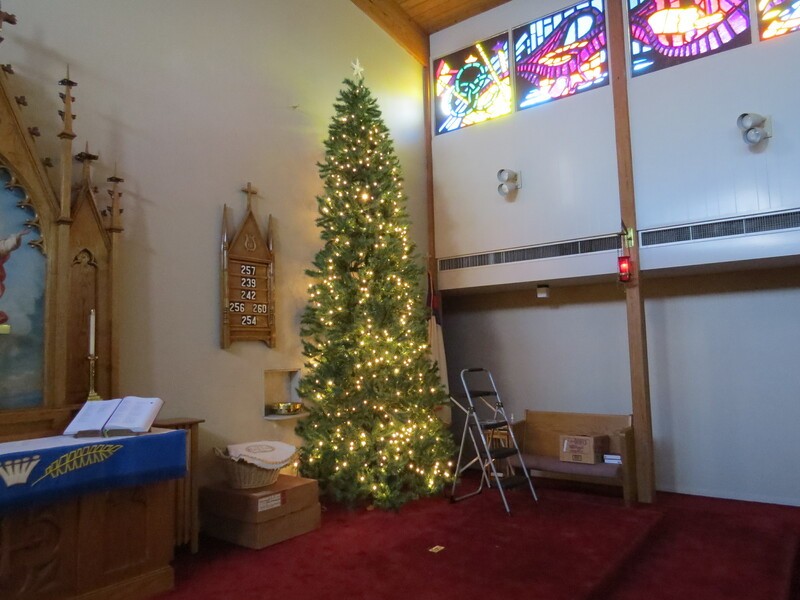 There will also be a Christmas Eve Candlelight Service with Holy Communion at 11:00 p.m. at our partner church, Waldeck Evangelical Lutheran Church. 6915 Waldeck Church Lane, Ledbetter, TX 78946, at the intersection of FM 2145 and FM 1291, about 6.5 miles south of Ledbetter. 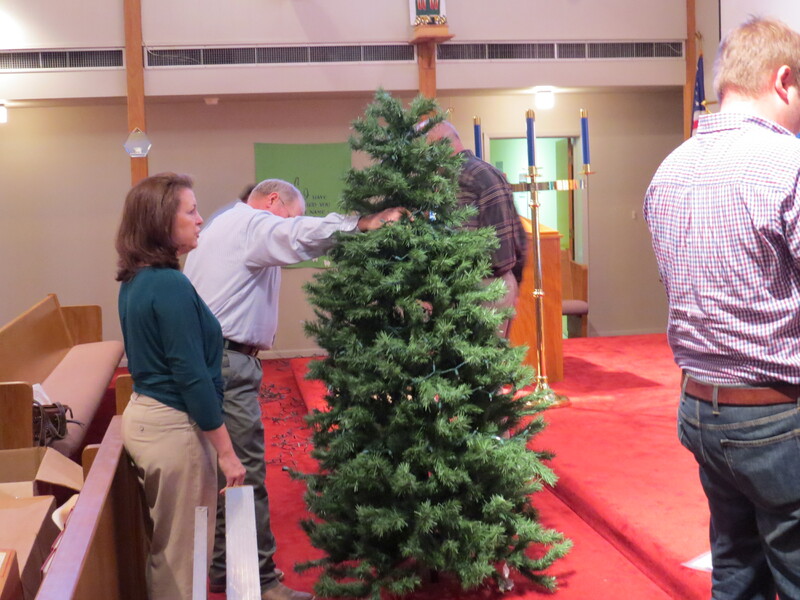 We will gather after worship on Sunday, November 25, to decorate the MLLC Sanctuary for the Advent and Christmas Seasons. This will take place about 11:15 a.m. on Sunday. We need plenty of workers of all ages to help with this fun and joyful event. One of the joys of our decorating is the use of Chrismons. As part of our decorating we will hang the Chrismons for the tree. These were made following patterns suggested and offered by the originators of Chrismons (click this link for more information from the official web site of Chrismons). 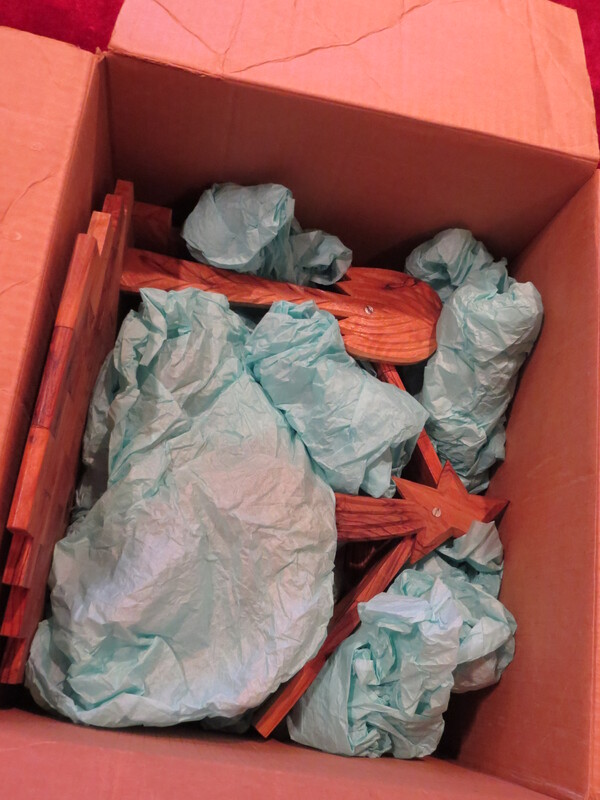 Here are some of the Chrismons which were carefully wrapped for storage since last year. 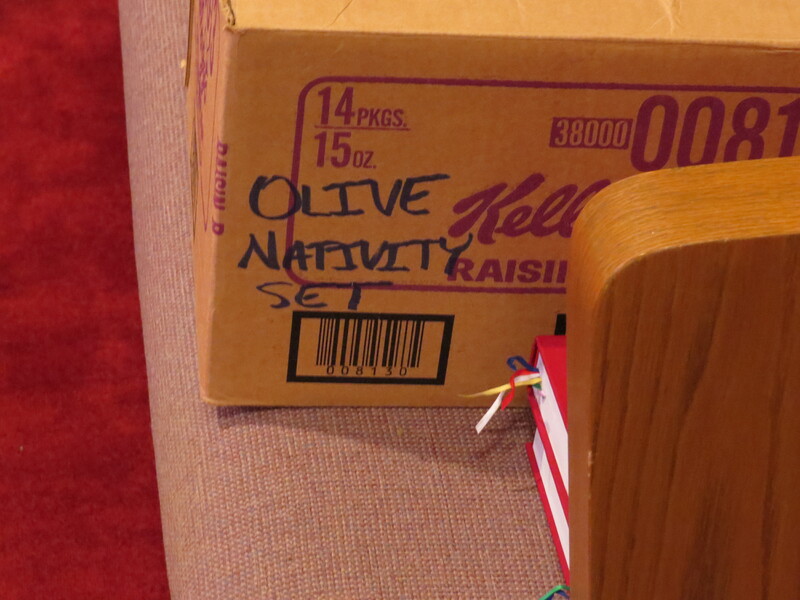 Our Olive Wood Nativity Set will be ready for set up as well. 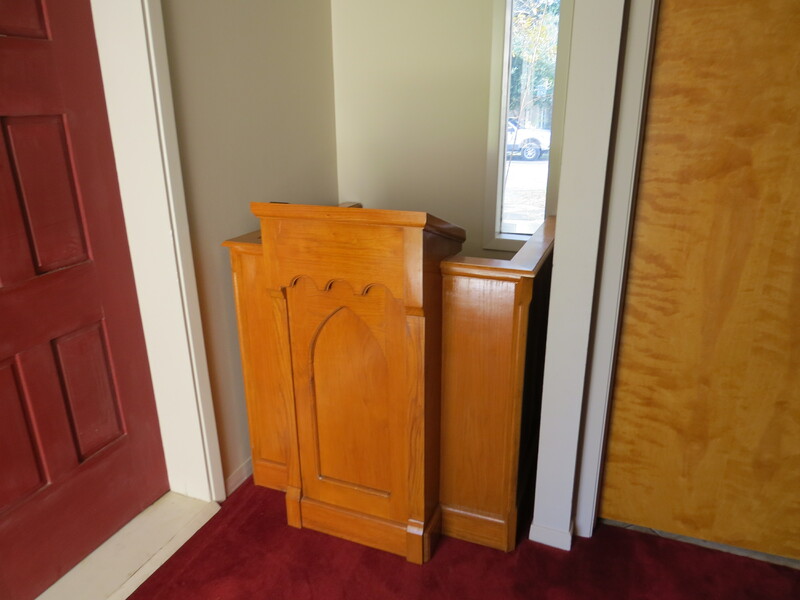 Our pulpit will be moved to a back corner to make room for the tree and Nativity scene. Here is what the finished product of the work on Sunday will look like. Every year at this time we gather items to pack and give to seafarers at the Port of Houston. We have done this for several years in a row, and we have great joy in doing it. The packing and wrapping of these boxes will be on Monday, November 26, at 6:00 p.m. All are invited to help with this joyful time of service. This even is sponsored by the Men in Mission of MLLC. For this year, please gather items such as these for the men on the ships – you can buy things throughout the year and drop these off at any time. These need to be brought to the church no later than 6:00 p.m. on Monday, November 26, 2018. If you can’t get the items to the church by that time, please donate them for the 2019 project.